AS MUCH as Greg Wilson is excited about DJing a big, open-air gig on the Pier Head in his home town of Liverpool – and he’s clearly thrilled – you also get the impression that he’s every bit as excited about the chance to talk about the ideas behind his involvement with the Very Big After Party. Transatlantic 175 is a commemoration of 175 years of passenger travel across the Atlantic, taking place on Liverpool’s waterfront and docks. It involves the Very Big Catwalk, an attempt to break the world record for most models on a catwalk, followed by the veteran DJ Wilson doing his stuff for the assorted fashion divas at the Very Big After Party. Wilson was brought in by Wayne Hemingway (whose Vintage Festival is also at the dock over the weekend), with a brief to highlight the musical connections between Liverpool and the US. The perceived wisdom is that the story of musical Liverpool all started with the Cunard Yanks, the merchant seamen who went to New York and took the music, the clothes, even the mannerisms they found back to their home city, planting the seeds that would eventually grow into the Beatles and Merseybeat. A young George Harrison, for example, bought a black Gretsch guitar from a Cunard Yank fresh off the boat from New York. “That’s not half the story, even though it’s massively important,” says Wilson over a tea cake in a restaurant on the seafront in New Brighton. “Bob Wooler, the DJ at the Cavern, told me that he got his records from everywhere, it wasn’t just about the Cunard Yanks. He told me he used to buy a lot of new American imports from a shop in Newton-le-Willows. That seemed a bit bizarre to me. But it’s next to Burtonwood Airbase. It makes complete sense. They were selling them to the US servicemen. 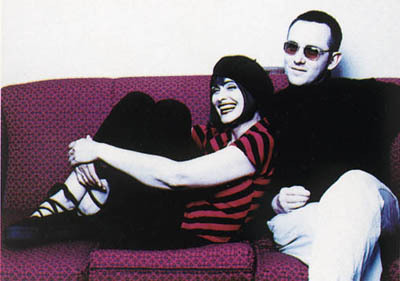 THE first time I ever got an inkling of the glamour surrounding Swing Out Sister was during a stint working behind the counter at a record shop in a dour northern steel town. One morning about 25 girls came in and asked for a record called Breakout by Swing Out Sister. None of us had ever heard of them but I liked the band already .. I liked them even more when I saw the beautifully designed sleeve for Breakout, featuring the group’s singer Corinne Drewery, with a look inspired by equal parts Kibuki theatre, Louise Brooks in Pandora’s Box and Tiger from The Double Deckers. By the time I heard the exuberant brass-heavy electro-funk of the record itself, I was sold. The whole package – the look, the music, even the name – exuded a certain elan, an effortless glamour, easy sophistication, sheer class. All qualities in short supply in Scunthorpe at that time. I interviewed Moonboots in July 2001 for the Big Issue in the North, just before the release of his mix for Phil Mison’s Soundcolors series, although I’d met him out and about a few years before that, and had been going to Aficionado, on and off, since the early days at Aqua. Unfortunately, space constraints meant that the interview wasn’t a long one – though since our sub editor managed to insert another D into ‘Addidas’, perhaps that’s just as well. That wasn’t embarrassing at all. Oh no. Tediously, I can’t find my original interview notes so I’ve added a review I did of Aficionado in January 2000. I have bittersweet memories of this particular night because I was ‘on a break’ with a girl I was seeing at the time, went down to Zumbar and got bowled over by this beautiful Dutch siren. Unfortunately, I didn’t get her number. I never saw her there again. Hmmm.